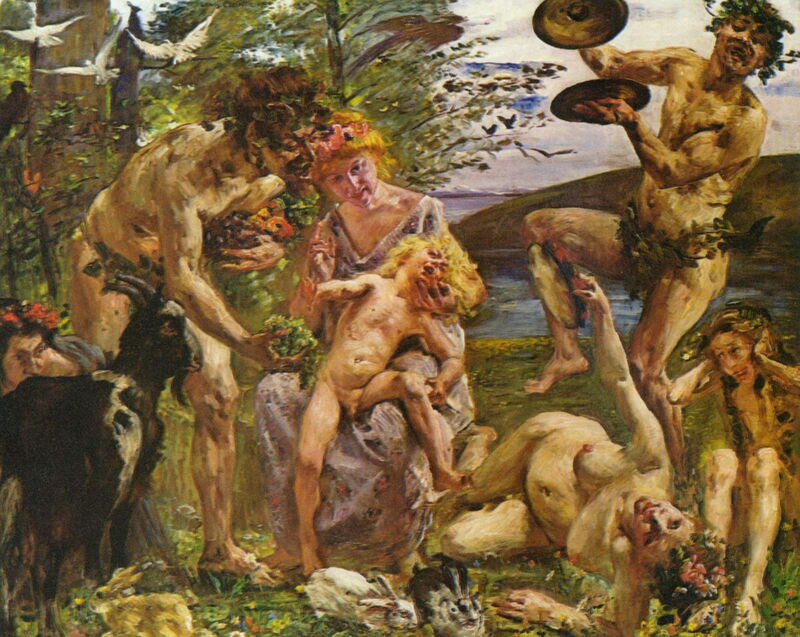 Lovis Corinth (1858–1925) defies simple classification, and has been variously described as a member of the Berlin Secession group, a Post-Impressionist, and an Expressionist. All those have a certain amount of truth, but none really describes his works. Interestingly, he was a contemporary of George Clausen, who makes a fascinating comparison! Born Franz Heinrich Louis in Prussia, he studied painting in Königsberg and Munich, and later travelled to Paris to study under Bouguereau and Robert-Fleury at the Académie Julian. He originally intended to be a history painter, but then concentrated on female nudes. 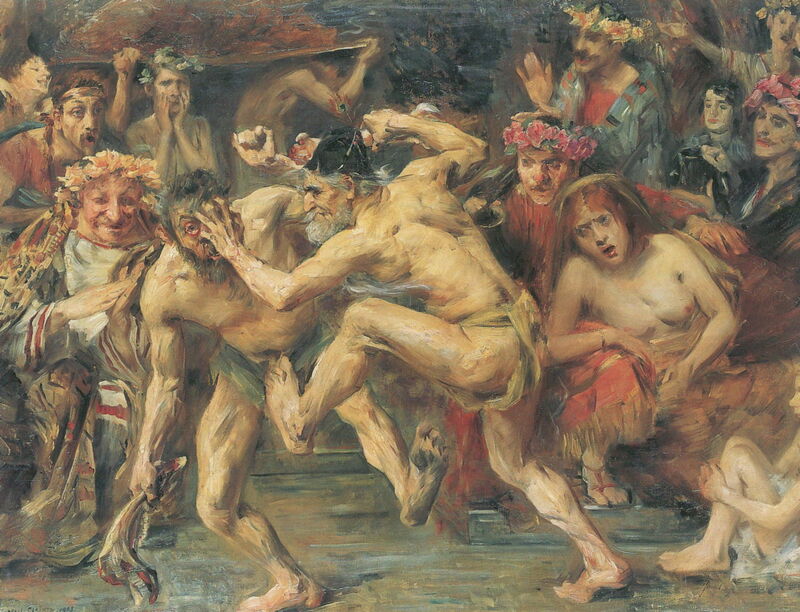 Frustrated by his failure to gain acceptance at the Salon, he returned to Königsberg in 1888 and adopted the name Lovis Corinth. He joined the Munich Secession in 1892 and engaged with the Berlin Secession, painting in a wide range of genres from landscape and portraits to history painting and religious works, each of which would merit an article of their own here. However, I will here focus on his narrative painting, in particular that of classical myths. Ulysses Fighting the Beggar (1903) depicts a story from book 18 of Homer’s Odyssey. Odysseus/Ulysses has finally returned to his home city of Ithaca and is now determined to kill the many suitors to his wife Penelope. As he plans this, he is disguised as a beggar. This fragment of the complex story starts with the arrival of a beggar named Arnaeus or Irus, who misguidedly picks a fight with Odysseus, who promptly floors the beggar, stopping just short of killing him. Corinth captures the fight as Odysseus (centre) is getting the better of Irus (left of centre), with various suitors and bystanders watching. Although painted loosely, each face has its own expression, ranging from amusement to apprehension, and there is abundant body language too. 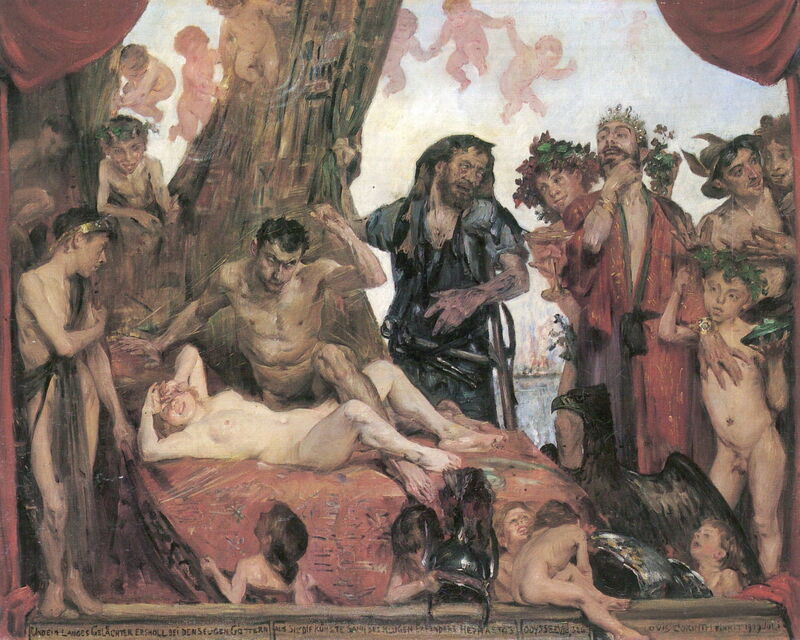 The Childhood of Zeus (1905-6) shows Zeus, the senior of the Greek pantheon, as a young boy (centre). According to the various myths, he was the son of Cronus and Rhea. Cronus swallowed his other children, so to save Zeus from that fate, Rhea gave birth in Crete, and handed Cronus a rock disguised as a baby, which he promptly swallowed. Rhea then hid Zeus in a cave, where he was raised by one or more of a long list of surrogates, including Gaia, a goat, a nymph, and others. Corinth shows several of those possibilities, including a goat. Homeric Laughter (1909) contains a complex assembly of mythical characters, invoked by a story contained within book 8 of Homer’s Odyssey. Odysseus is here being entertained by King Alcinous, after he met Nausicaä on the island of the Phaeacians. To cheer Odysseus up, the bard Demodocus tells a tale of the illicit love affair between Ares/Mars (god of war) and Aphrodite/Venus (god of love), which has been very extensively shown in paintings. In this first version, Corinth shows Aphrodite recumbent on the bed, shielding her eyes from the crowd around her. Ares struggles with the net which secures the couple, looking frustrated. Hephaistos, clad in black with his tools slung around his waist, is talking to Poseidon (wearing a crown) with Dionysos/Bacchus behind him (clutching a champagne glass). At the right edge is Hermes/Mercury, with his winged helmet. Sundry putti are playing with Ares’ armour, and an arc of putti adorns the sky. Corinth also made a second version, which he etched in 1920 to make prints. In 1911 he suffered a stroke which left him with partial paralysis of his left side. This was initially devastating, as he had painted with his left hand. Over the following year, with the help of his wife, he learned to paint with his right hand, but never recovered the eloquence which he had before his stroke. One of his first substantial history paintings after that stroke was Ariadne on Naxos (1913), the focus of this article. Ariadne was the daughter of Minos, the King of Crete. Her father made her responsible for the labyrinth (created by Daedalus) which contained the Minotaur, and for its periodic sacrifices to the Minotaur. One year, Theseus, son of King Aegeus, volunteered to be a member of the sacrificial party, so that he could kill the Minotaur and put an end to the sacrifices. When Ariadne met Theseus, she fell in love with him at first sight, and helped him in his mission by providing him with a sword, and a ball of thread which he could use to find his way back out of the labyrinth. Once Theseus had killed the Minotaur and found his way back out of the labyrinth, Ariadne eloped with him to the barren island of Naxos. Once there, Theseus had tired of her, and abandoned her; she only had her attendant nymphs Naiad, Dryad, and Echo for company. In some versions of the myth, she then longed for death, and when Dionysus (Roman Bacchus) arrived, she married him, and bore him many children. She was later killed by Perseus at Argos. 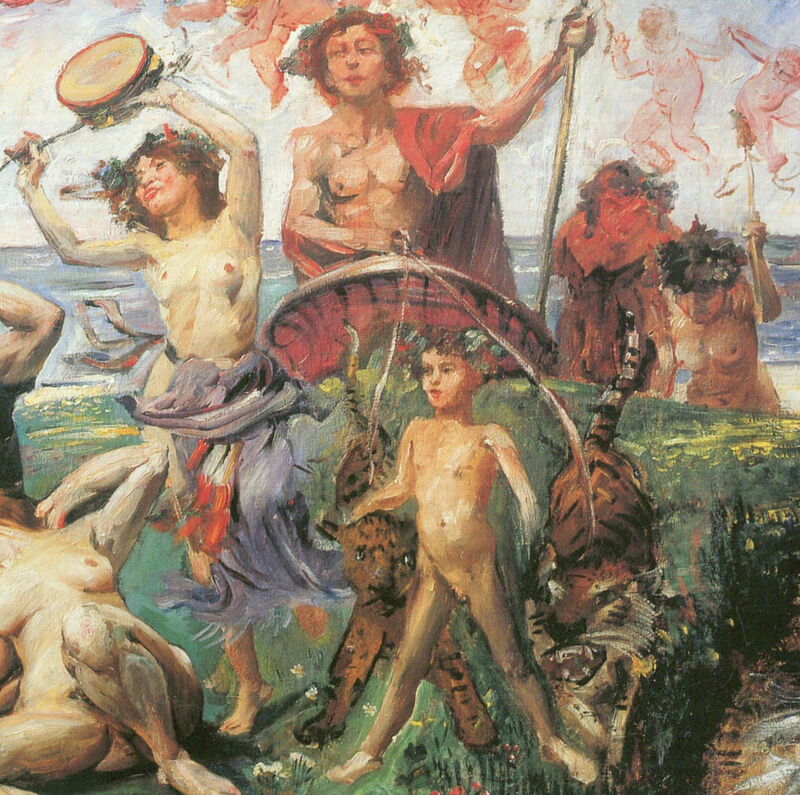 Corinth’s Ariadne on Naxos was inspired by Richard Strauss’s opera Ariadne auf Naxos (1912). Strauss revised this substantially in a second version of 1916. The original version is a 30 minute divertissement performed at the end of an adaptation by Hofmannsthal of Molière’s play Le Bourgeois Gentilhomme (in English, known as The Perfect Gentleman). This was first performed in Stuttgart in October 1912, and Corinth seems to have attended its Munich premiere on 30 January 1913. Corinth’s painting shows a group of figures from classical myth on a symbolic, if not token, island. Most remarkable here is the way in which Corinth has combined two separate events in this myth into a single image: Ariadne’s eventually broken relationship with Theseus, and her subsequently successful affair with Dionysus. This is, of course, a technique sometimes known as continuous narrative, and more typical of narrative paintings in the early Renaissance and before. 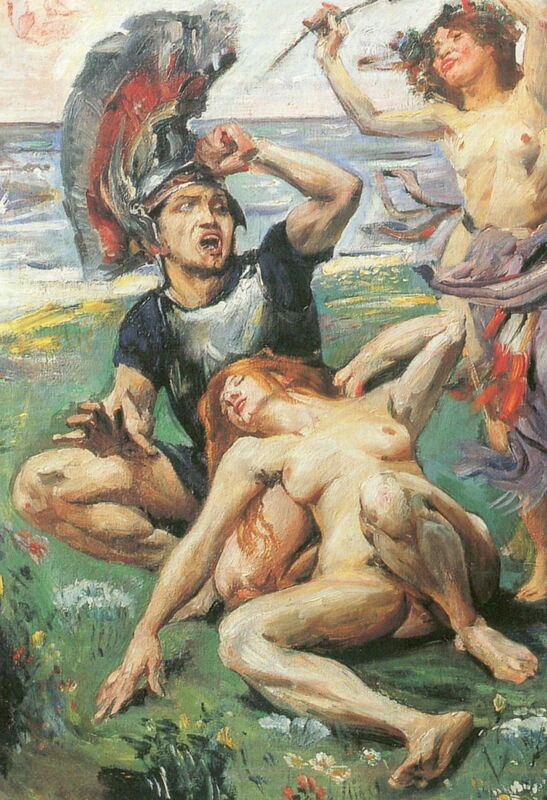 It has been stated that Corinth’s painting adopts a similar theme to Strauss’s opera, that of pretension in art, itself a development of the original story’s theme of faithfulness. A monoscenic approach to depicting the story in a painting, either showing Theseus abandoning Ariadne, or Dionysus discovering her (the most common treatment), is neither strong in a narrative sense, nor complete. By combining the two scenes in a single painting, Corinth gives as full an account as in other media. 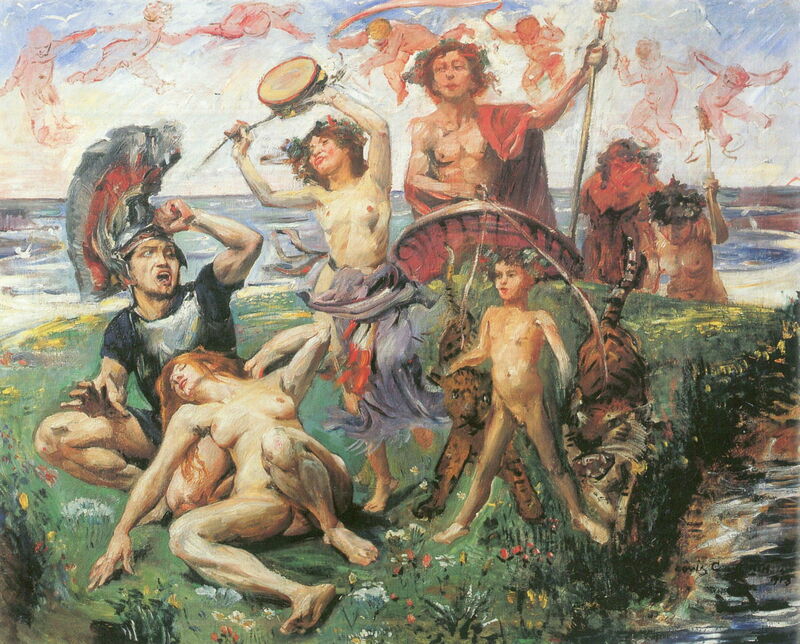 Lovis Corinth painted many quite complex and sophisticated narrative works, of which this is a small selection of those drawn from classical myths. He used traditional narrative tools as laid down by Alberti, and in at least one painting composited two separate scenes from the same story into a single image – so-called continuous narrative, which had not been popular for over four hundred years. Although inspired by a contemporary opera, Corinth did not depict a single scene in the opera, but told the story in his own way. By combining the two scenes in one painting, Corinth tells the whole story, although its cost is a more complex painting which some may find confusing. I strongly recommend making comparison between the text narrative, Richard Strauss’s opera, and Corinth’s painting, as an exercise in the comparison of narrative techniques. Lemoine S et al. (2008) Lovis Corinth, Musée d’Orsay and RMN. ISBN 978 2 7118 5400 4. Ariadne auf Naxos, opera by Richard Strauss – Wikipedia on the opera. I recommend the Salzburg Festival version of 2014, which is the first (1912) version and a fine production. It is available on iTunes. Posted in General, Life, Painting and tagged Corinth, Expressionism, narrative, Opera, painting, Strauss. Bookmark the permalink.